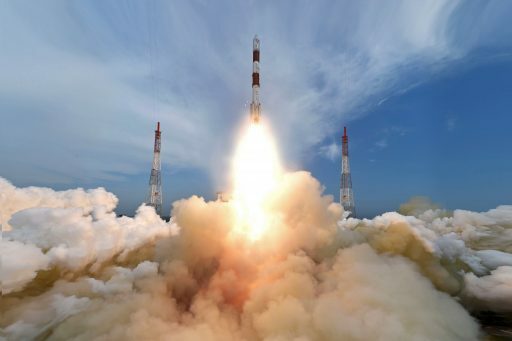 India’s Polar Satellite Launch Vehicle lifted off from the Satish Dhawan Space Center at 3:42 UTC on Monday on a record-setting mission to deliver eight international satellites to two different orbits. Monday’s PSLV mission was setting a pair of records for India’s workhorse rocket – a) it was the first multi-orbit mission in the launcher’s 23-year career, creating an unprecedented ascent duration of two hours and 15 minutes; and b) it marked the first time PSLV flew five times in a calendar year. 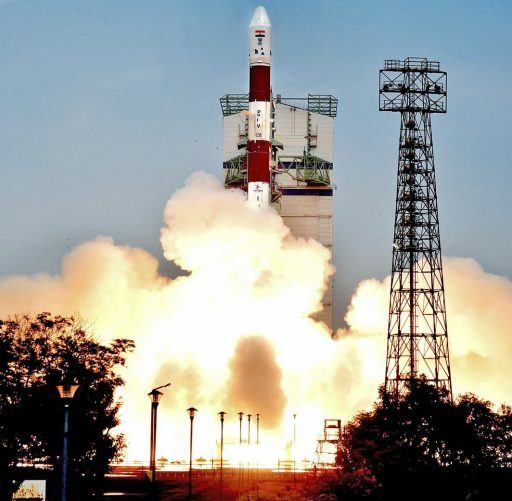 The Indian Space Research Organization was able to ramp up the PSLV launch rate in recent years to allow the vehicle to become a workhorse for Indian missions to all types of orbits and beyond Earth as well as commercial flights with international customers. 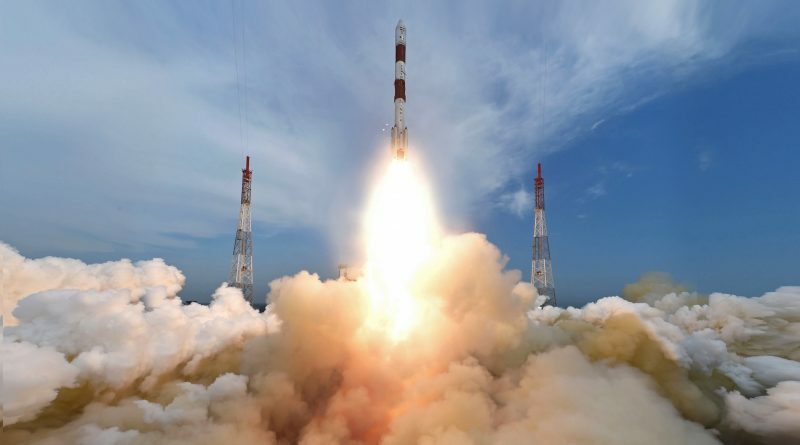 Multi-orbit capability was deemed a critical capability to make PSLV even more competitive on the international market with each mission customizable for multiple customers. 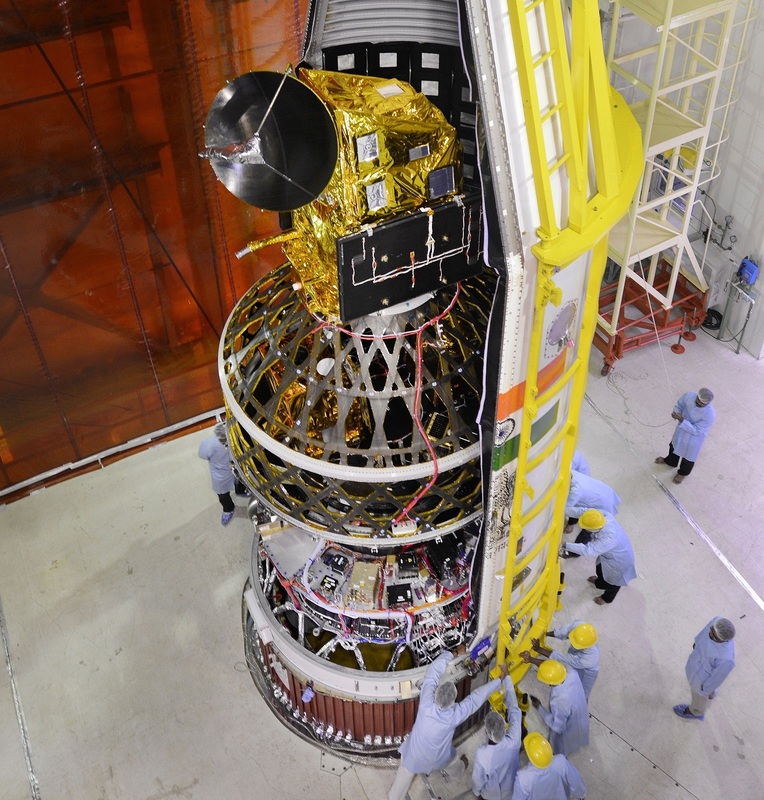 For Monday’s mission, eight satellites were packed inside PSLV’s payload fairing for operators from India, Algeria, Canada and the U.S. Riding atop a Secondary Payload Adapter was SCATSat-1, a small satellite outfitted with a scatterometer to bounce radio signals off the ground to measure ocean surface winds – a critical ingredient for weather forecasting models. Sitting under the payload adapter and aiming for a lower orbit than SCATSat were seven secondary payloads – a pair of Algerian Earth Observation Satellites built in cooperation with UK’s Surrey Satellite Center & Airbus, a pair of educational satellites from Indian institutions, an American Earth Observation Satellite to mark the inauguration of a commercial imaging architecture, and two CubeSats from Canada and Algeria/UK to demonstrate a new drag sail and a large extendable tube structure in orbit. 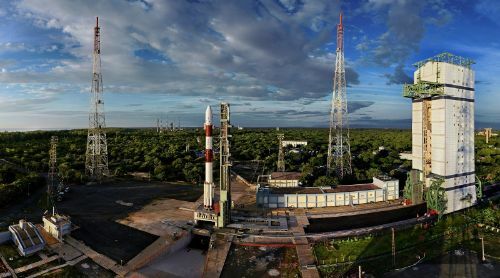 Setting up for a 9:12 a.m. local time liftoff on Monday, PSLV headed into its 48-hour countdown on Saturday after being revealed atop the First Launch Pad at SHAR the day before. 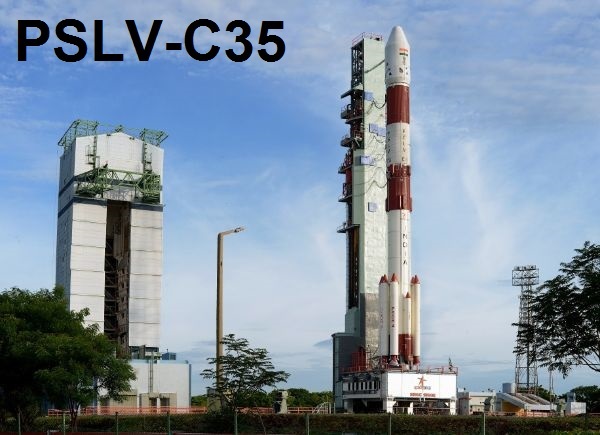 The C35 mission used the PSLV-G version, also known as the ‘Regular’ configuration that differs from the more-powerful XL version through the use of smaller PSOM Solid Rocket Boosters. PSLV-G was the baseline version of the launch vehicle flown exclusively until the inauguration of the PSLV Core Alone Version in 2007 that omits the boosters from the first stage and the more-powerful XL variant with stretched boosters introduced back in 2008. PSLV is a four-stage rocket that harnesses the power of Solid Rocket Motors and combines it with the controllability of liquid-fueled rocket engines. Standing 44.5 meters tall, the PSLV-G version weighs 295 Kilograms at liftoff and is capable of lifting 1,675 Kilograms into a Sun Synchronous Orbit. 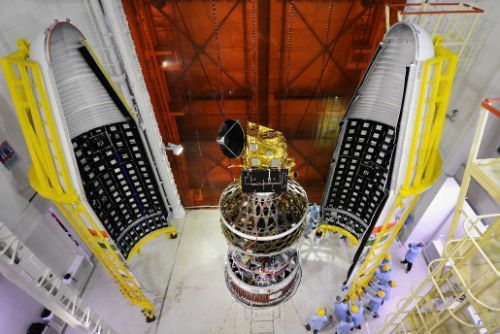 Standing fully fueled atop its launch pad, PSLV went through a smooth countdown, passing final checkouts with flying colors and entering its critical automated countdown sequence 12 minutes prior to launch after the readiness of all launch vehicle, payload and ground systems was verified. 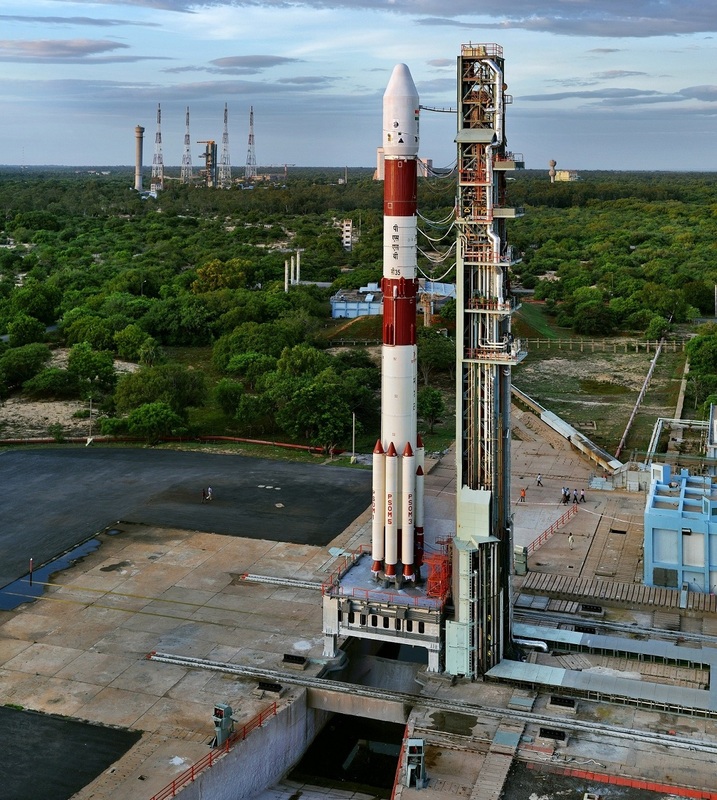 Having pressurized its tanks and switched to internal power, PSLV was handed control of the countdown at T-30 seconds when the Real Time Program kicked in. The rocket started breathing fire at T-3 seconds when the first stage started its roll control thrusters, followed by the ignition of the powerful core stage and four of the solid rocket boosters at 3:42:00 UTC, catapulting the vehicle off its launch pad at an initial thrust to weight ratio of 2.4. Burning 1,600 Kilograms of solid propellant each second of powered flight, PSLV quickly completed its vertical climb and swung to a south-easterly heading. 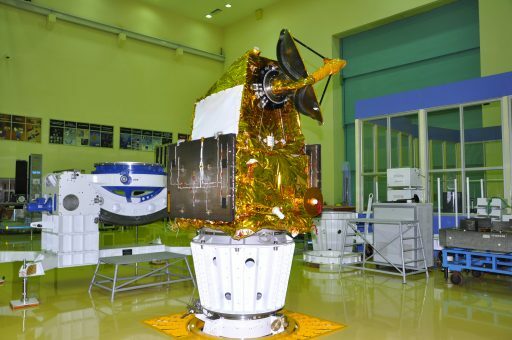 The vehicle initially held this heading to get clear of the island of Sri Lanka before executing a guided turn to transition to a south-westerly trajectory in order to achieve the planned 98-degree inclination of its target polar orbit. The two remaining boosters fired up 25 seconds after liftoff, raising the rocket’s thrust to 803 metric-ton-force. Each consuming 9,000kg of propellants, the ground-lit boosters burned out 45 seconds after launch and separated in pairs at T+68 seconds, followed twenty seconds later by the air-lits. The core stage lifted the rocket to an altitude of 65 Kilometers and a speed of over two Kilometers per second when burning out and separating from the PS2 stage one minute and 53 seconds into the mission. PS2 immediately ignited its 80-metric-ton Vikas engine for a burn of 2.5 minutes during which the vehicle initiated the dogleg maneuver to attain its proper course to the south-west, heading across the Indian Ocean. Passing 115 Kilometers in altitude, PSLV dropped its fairing and switched to Closed Loop Control, processing navigation data and adjusting its flight profile to meet the precise cutoff targets. The second stage handed duties off to the PS3 four minutes and 25 seconds after launch, passing through 223 Kilometers in altitude. PS3 fired its 25-metric-ton-force solid rocket motor for 112 seconds, increasing the vehicle’s speed to 6.5 Kilometers per second. PSLV held the spent stage for three minutes to ensure a clean spring-actuated separation after all residual thrust had tailed off on the PS3. After staging, the PS4 continued passive flight for another 2.5 minutes, climbing to an altitude of 680 Kilometers for the first ignition of its two L-2-5 engines. PS4 soared to 1,500 Kilogram-force of thrust and fired for 4.5 minutes to push the stack into what was expected to be a 730-Kilometer Sun Synchronous Orbit, inclined 98.1 degrees. Immediately after shutdown, PS4 reduced body rates and set up for the separation of this mission’s primary payload. The 371-Kilogram SCATSat-1 was sent on its way right on the mark at T+17.5 minutes with orbital parameters closely matching the prediction. SCATSat-1, outfitted with a precise scatterometer instrument, closes a gap in ocean surface wind data between the OceanSat-2 satellite that concluded its mission in 2014 and an improved successor expected to fly around 2018. India relied on data shared by NASA over the past two years and there was a strong desire to launch an interim mission to ensure the country has continuous access to this vital weather forecasting parameter. SCATSat-1, utilizing a Mini Satellite Bus, was put together in just one year, hosting a rotating dish antenna that bounces radio pulses off the ocean surface and gathers wind speed and direction data through analysis of the reflected echo. 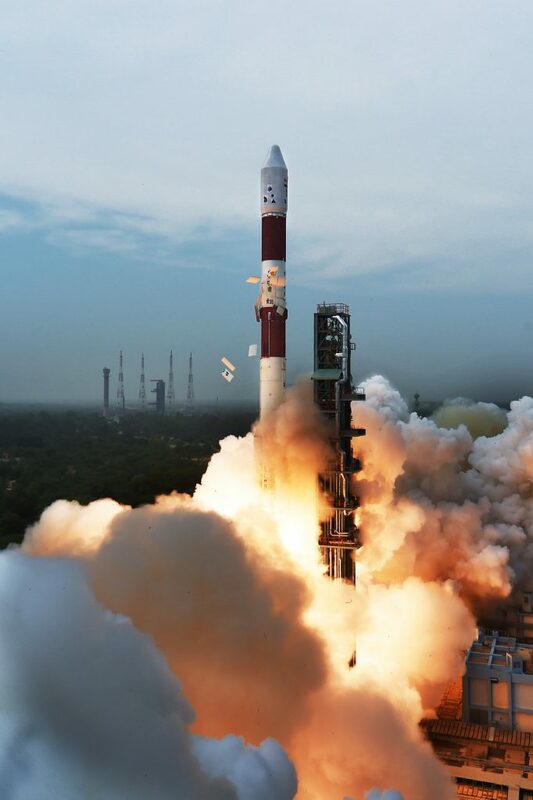 With SCATSat-1 on its way, PS4 headed into previously uncharted territory for PSLV as the vehicle was not conceptualized for multi-orbit missions. Based on demand from its customer base, ISRO began studying multi-orbit mission scenarios a few years ago and determined it would be possible for PSLV to fly extended multi-burn missions without major modifications to its fourth stage. A re-start test of the L-2-5 engines in December showed very stable performance and a complete two-hour mission rehearsal was completed on the C34 mission in June after the primary payloads had been deployed. PS4 was modified for extended missions by enhancing its power margin, improving its navigation system and implementing new techniques for propellant management, coast phase thermal control and extended mission communications. Monday’s flight took the PS4 through a 65-minute coast phase to reach the North Pole and perform the first 20-second orbit-lowering maneuver in view of the Svalbard ground station in Norway, decreasing the low point of the orbit to 689km in altitude and beginning to modify the orbit’s inclination. Next was a 49-minute coast of half an orbit with the second re-start occurring over Antarctica for another 20-second retrograde burn that was to circularize the orbit at 689 Kilometers, inclined 98.21°. Upon completion of its propulsive flight phase, the PS4 stage jettisoned its Secondary Payload Adapter to reveal its seven passengers for a rapid deployment sequence taking just 130 seconds, beginning two hours and 12 minutes into the mission. 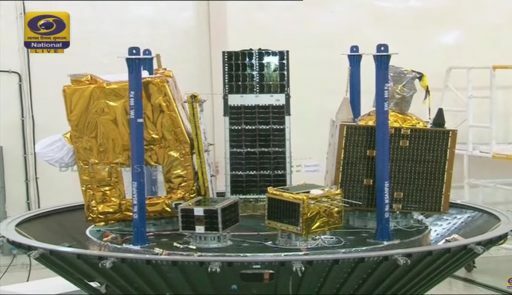 First to be released were the smallest passengers, a pair of 3U CubeSats – AlSat-1N built by Algeria and the UK to demonstrate different smallsat technologies including an extendable boom, and CanX-7 from Canada setting out to test a drag sail that could help remove satellites from orbit and mitigate the growing space debris problem. Next up were the two educational satellites built by IIT Bombay and PESIT students. Pratham aims to demonstrate a small satellite platform and measure the Total Electron Count in Earth’s ionosphere while the PiSAT spacecraft carries an Earth Observation camera capturing imagery at an 80-meter resolution. Two Algerian Earth Observation Satellites were onboard the C35 mission – AlSat-1B that was built in cooperation with Surrey Satellite Technology in the UK to join the medium-resolution segment of the country’s Earth imaging architecture, and AlSat-2B using Airbus Defence and Space Technology and the NAOMI imager to capture sub-meter resolution photos of the Algerian territory. The final passenger released in Monday’s flight was the BlackSky Pathfinder, the first satellite launched by Seattle-based start-up BlackSky Global, aiming to establish a constellation of commercial imaging satellites to deliver imagery at the highest revisit rates in the industry.